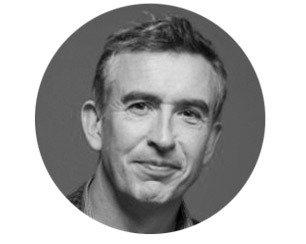 Steve Coogan is an English writer, producer, actor and stand-up comedian. His career began in the 1980s, as a voice artist on the satirical puppet show, Spitting Image. In the early 1990s, he began creating original comic characters; this led him to win the Perrier Award at the Edinburgh Festival Fringe 1992. Coogan’s most popular character, Alan Partridge, is a socially awkward and politically incorrect regional media personality. This television character earned Coogan three BAFTA nominations and two wins for Best Comedy Performance. Coogan’s most recent writing accomplishments include Despicable Me 2, which won Best Screenplay at the Venice Film Festival; and Philomena, which received an Oscar and Golden Globe nomination for Best Screenplay.